When you think of gourmet you probably think delicious. But you also may think expensive and hard to make as well. But that isn’t always the case. 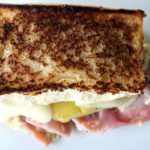 In fact, there are simple ways that you can dress up the most delicious meals that wont take a huge bite out of your grocery budget, like with these 5 delicious recipes for gourmet grilled cheese sandwiches. I love recipes that taste gourmet but include simple to find ingredients. You can usually find the Kings Hawaiian buns at Walmart and other grocery stores. And due to their rising popularity you can often find generic versions as well. If you don’t have shallots then you could probably just substitute another minced onion. 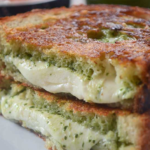 If you have an abundance of basil in your garden then you could make this delicious and gooey pesto mozzarella grilled cheese (and of course, jarred pesto would work as well). 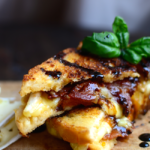 Besides the pesto, this gourmet grilled cheese sandwich uses just a few basic ingredients that you may already have on hand. It is also a great way to use up leftover crusty bread. This recipe would pair well with a cup of tomato soup. I love anything with avocado, including delicious guacamole. And nowadays guacamole is so popular that you can usually buy it already made at the grocery store or save money and make it yourself. 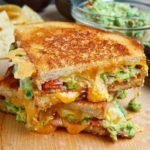 This recipe for Bacon Guacamole Grilled Cheese has just a few simple ingredients but is so good. You could also customize it with some sliced tomato or maybe a different kind of cheese. Either way, this sandwich is easy to put together and makes for a great sandwich on a frugal budget. The recipe suggests using the guacamole at room temperature, which makes sense so you aren’t biting into cold guacamole, but I am so funny about leaving food out that should be refrigerated. According to Our Everyday Life, guacamole should not sit out more than two hours (or less than an hour if serving outside on a hot, 90 degree or above day). Just keep that in mind :). This Italian grilled cheese sandwich is the ultimate way to use up leftover marinara sauce and crusty bread from a nice Italian dinner the night before, which means not only do you save time, but you save money as well with delicious planned leftovers. This grilled cheese calls for just a few ingredients (including two kinds of cheese) for a delicious and gooey grilled cheese sandwich. Fresh basil is optional, but if you happen to have some on hand you should add that as well. Honestly I wasn’t going to include this sandwich on my list because it just seemed a bit too “gourmet” for a blog about eating on a budget. However, since discovering all sorts of inexpensive gourmet ingredients like brie at my local Aldi I just had to include it. What’s not to love with the yummy combination of sweet and salty. It also calls for a Balsamic vinegar reduction but don’t worry, it’s really easy to do. These are just a few delicious recipes for gourmet style grilled cheese sandwiches. And the nice part about these sandwiches is they don’t take much more work than a traditional grilled cheese sandwich would take. 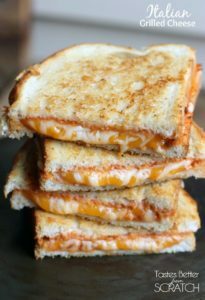 If you have your own favorite grilled cheese sandwich I would love to hear about it. Please feel free to comment below.